If Someone Took Everything You Live For ... How Far Would You Go To Get It Back? Academy Award(R) winner Jodie Foster gives an outstanding performance in the heart-pumping action thriller Flightplan. Flying at 40,000 feet in a state-of-the art aircraft that she helped design, Kyle Pratt's (Foster) 6-year-old daughter Julia vanishes without a trace. Or did she? No one on the plane believes Julia was ever onboard. And now Kyle, desperate and alone, can only count on her own wits to unravel the mystery and save her daughter. $24.629 million on 3424 screens. Idiocy on parade: when Flightplan hit movie screens in the fall of 2005, the Association of Professional Flight Attendants (APFA) called for a boycott. Don’t these folks have anything better to do? My best friend works as a flight attendant – in fact, he’s employed at one of the airlines represented by these bozos – and he’s as irritated at this pointless protest as I am. Or maybe more annoyed, since he’s closer to the situation. The APFA whined that the movie made flight attendants look “rude, unhelpful and uncaring”. Based on all the horror stories my friend’s told me about his coworkers, I’d say that’s just about right! Like all moronic protests, the biggest problem with this one is that it bears no connection to reality. It’s real stretch to see this negative portrayal in Flightplan. To compare to another Jodie Foster movie, it’d be the same as if I attacked The Silence of the Lambs for its negative depiction of psychologists since that’s my real job. Folks – it’s a movie, and not one that goes out of its way to slam flight attendants or other air personnel. If anything, it makes them look more reasonable and compassionate than they really are. Rant mode off – now I can chat about the movie itself. At its start, Flightplan introduces us to very recent widow Kyle Pratt (Foster) and her six-year-old daughter Julia (Marlene Lawston). Kyle’s husband David (John Benjamin Hickey) died in a mysterious fall and they’re taking him from their home in Germany back to America for his burial. Not surprisingly, these events have left Kyle in a messy emotional state, and we soon start to wonder just how discombobulated she really is. Kyle nods off during the long flight, and when she wakes up, Julia is nowhere to be seen. She panics and pesters the flight crew to search every nook and cranny to find her. The staff attempts to accommodate her, but matters become complicated because no one remembers seeing the kid on the plane, and the flight manifest bears no record of her arrival on it. The movie follows Kyle’s increasingly distraught state and her search’s impact on all around her. This involves Air Marshal Gene Carson (Peter Sarsgaard), the plane’s pilot (Sean Bean), the flight attendants, and many of the passengers. We watch as all involved try to separate fact from fiction and settle the mystery. Shades of The Forgotten! That movie enjoyed a similar theme in which a mother is led to question the presence of her child. Actually, Forgotten disputed whether or not the kid existed at all, whereas Flightplan simply looks at whether or not Julia was on the plane. Nonetheless, the similarities are prominent, and it doesn’t help that Foster and Julianne Moore are similar enough actors that Moore took over the Clarice Starling role in Hannibal. Despite those connections and a mess of other problems, I think Flightplan offers a pretty enjoyable experience. The story bases itself much more in the real world than does the supernatural Forgotten, so the similarities fall by the wayside. It’s also significantly more entertaining than the messy Forgotten, and that makes a big difference. Not that one should expect a logical, well-thought-out film from Flightplan. This isn’t a movie with some plot holes; it’s a series of plot holes with a film fashioned around them. Many flicks require you to turn off your brain and go with the ride if you want to enjoy them, and that’s definitely the case with Flightplan. So many of its moments stretch credulity that it’d be virtually impossible to have a good time with it if you examine it too closely. Obviously, I’d prefer a movie with a more logical bent, but I simply had too much fun with Flightplan to worry a lot about its many storytelling flaws. Braindead as it may be, the film presents a tense and exciting tale. 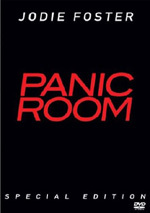 It sweeps us up in its plot of paranoia and potential conspiracies and makes sure that we feel the angst. Of course, when we down to the truth of the matter, everything becomes unhinged due to its inherent absurdity, but I was too invested in things to lose interest. All the storytelling concerns mean that I can’t offer a glowing recommendation for Flightplan. However, I think it’s a lively enough little popcorn flick for me to give it a decent endorsement. Silly as it may be, it delivers an hour and a half of good thrills, and that makes it worthwhile for what it is. 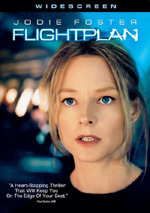 Flightplan appears in an aspect ratio of approximately 2.35:1 on this single-sided, double-layered DVD; the image has been enhanced for 16X9 televisions. Though Flightplan looked good more than it looked good, the transfer was awfully spotty. Sharpness demonstrated the majority of the issues. Much of the movie appeared reasonably concise and accurate, but that varied an awful lot. Many shots were moderately soft and ill-defined. This occurred largely due to some prominent edge enhancement, as those haloes created a lowered level of precision. No issues with shimmering or jagged edges occurred, and source flaws were minimal. I noticed a few specks but that was it. Flightplan went with a very limited palette. It strongly favored cold, metallic blues, and those dominated the movie. Within that range, the colors were fine. They didn’t have enough variation to tax the image, but they looked appropriate. Blacks were a little inky, however, and shadows tended to be moderately dense. Due to that issue as well as the sharpness problems, Flightplan occasionally seemed rather murky. This wasn’t a terrible transfer, but it suffered from too many concerns. At least the audio of Flightplan was more consistently satisfying. The DVD featured both Dolby Digital 5.1 and DTS 5.1 mixes. As usual, the DTS track was a little louder than the Dolby one, but when I compensated for that factor, I thought the pair sounded virtually identical. The mixes varied in their scope dependent on the situation. A lot of the time, they focused solely on general airplane ambience. This meant a constant hum of the engines and small bumps and jolts along the way. However, the tracks also kicked into higher gear during a number of scenes. Takeoffs and landings filled the speakers well, and the various action sequences on the plane also offered a lot of good information. The five speakers blended all of this well and helped to form a strong sense of environment. The soundfields really aided the effectiveness of the movie; they may have been subdued much of the time, but they were more than satisfying for this material. The solid quality of the audio didn’t hurt matters. Speech was always concise and crisp, with no brittleness or other problems. Music was clear and lively. The score showed good range and filled out the track well. Effects were quite nicely rendered. Whether loud or soft, they seemed clean and snappy, and they presented excellent range. Bass response was particularly good; the track blasted my subwoofer with tight tones and never became distorted or boomy. These tracks nearly made it to “A” level, as they impressed me. Moving to the set’s supplements, we open with an Audio Commentary from director Robert Schwentke. He offers a running, screen-specific discussion. Schwentke chats about the original script and changes made to it, telling the tale and many story issues, casting, extras and acting topics, location shooting, the airplane set, various visual effects, sound design, lighting and cinematography, and making the jump from independent films to studio productions. Schwentke offers an unusually thoughtful track. He digs into his decisions and choices with gusto and fleshes them out well. You’ll find little of the standard gushing praise for the film and all involved, as Schwentke instead sticks to the nuts and bolts of creating the flick. This turns out to be a very informative and rich commentary. Next comes a five-part documentary entitled The In-Flight Movie: The Making of Flightplan. It splits into these topics: “Story of a Thriller”, “Meet the Director”, “Casting the Film”, “Post Production” and “Visual Effects”. Taken together, all five fill a total of 38 minutes and 31 seconds. They use a mix of movie shots, behind the scenes elements, and interviews. We hear from Schwentke, screenwriters Billy Ray and Peter A. Dowling, producer Brian Grazer, executive producers Robert DiNozzi and Charles JD Schlissel, editor Thom Noble, supervising sound editor Dave McMoyler, composer James Horner, visual effects supervisors Gregory Leigey and Roger Hodgson, visual effects producer Henric Nieminen, and actors Jodie Foster, Peter Sarsgaard, Sean Bean, Kate Beahan, and Erika Christensen. You can guess the subjects covered based on those headers, but I’ll relate the details anyway. We learn about the development of the screenplay and characters, Schwentke’s style as a director and what he brought to the production, casting and the qualities of the actors, editing and pacing, sound and score, and visual effects. After Schwentke’s commentary, much of “Making” feels somewhat superfluous. It covers most of the same topics and doesn’t add much to our understanding of them. Indeed, it suffers from the happy talk that was happily absent from Schwentke’s discussion, and we also see too many movie clips. I like the many shots from the set and some audition clips, and we find some nice insights about Sarsgaard’s style as well as info about the effects. Otherwise, this is a fairly ordinary program. A featurette called Cabin Pressure: Designing the Aalto E-474 follows. This 10-minute and one-second piece includes notes from Schwentke, Schlissel, Beahan, Bean, production designer Alec Hammond, and director of photography Florian Ballhaus. This looks at the design and build of the movie’s airplane. Much of it concentrates on Hammond as he leads us through a tour of the set. We also get some notes about extras and a few other elements connected to the set. I’m not sure why this featurette isn’t part of the “Making” documentary, but it’s a tight examination of its subject. The DVD opens with some ads. We find promos for Annapolis, The Chronicles of Narnia: The Lion, the Witch and the Wardrobe and Proof. These also appear in the Sneak Peeks domain along with trailers for Shadows in the Sun, Everything You Want, The Greatest Game Ever Played, Lost and TV on DVD. No one will mistake Flightplan for a seamless thriller without plot holes. Despite its flaws, it compensates with an energy and tension that allow it to prosper. The DVD offers surprisingly murky visuals along with very good audio and a mix of supplements bolstered by an excellent audio commentary. At the very least, Flightplan merits a rental.